Talk about economic inclusion, connections, networking and just plain old learning about where the opportunities are in Maryland, Baltimore County Public Schools and County Government’s Meet the Primes 10th Annual Meet & Greet was where all the Minority Business Enterprise (MBE) action was on Wednesday, October 17, 2018. 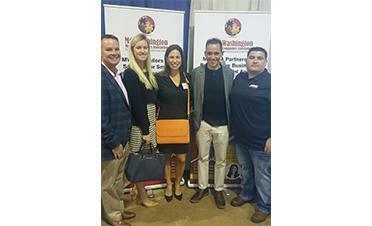 While driving up to the spacious Maryland State Fairgrounds in Timonium, Maryland at 9:00am, one could not locate a parking space, and the event broke a record with over 1,000 businesses registered seeking opportunities. The K-12 school system and county government are the only local government entity's in Maryland that host a massive outreach for businesses to meet with over 125 exhibitors and conduct private meetings with prime companies who meet with business representatives to discuss their capabilities during the One-To-One Introduction Meetings. Many of the small businesses who participated in the One-to-One Introduction Meetings found the private meetings to be invaluable, select here to read their testimonials of how it helps their businesses. Robert Ball, MBE Outreach Liaison, serves in a co-leadership role along with Melanie Webster, Office of Purchasing Manager and Carla Tucker, Minority and Small Business Marketing Manager to produce one of the most attended outreach events of the year. “It gives me great pleasure to produce this event along with my wonderful colleagues. We work hard to get it right and to see so many businesses attend and connect with primes who have the opportunities. After all of these years this event exceeds my professional expectations and I especially wish to acknowledge the many K-12 public school systems, colleges and universities who join us too! Now, we will start to prepare for next year”, said Bob Ball. One of the exhibitors was Goldman Sachs 10, 000 Small Businesses who came to recruit small business CEO’s for their upcoming January 2019- Cohort “6” and their exhibit was action packed the entire morning. Wayne R. Frazier, Sr., President of Md. Washington Minority Companies Association (MWMCA) represented MWMCA’s exhibit booth and he said “Baltimore County Public Schools & Baltimore County Government have proven to be the best sub-division in the state for outreach and inclusion. 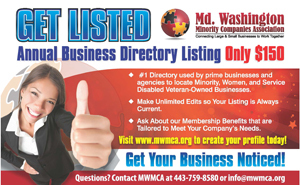 They allow MWMCA, a small business to provide the marketing and advertising for the event in addition to producing and managing the One-To-One Introduction Meetings that have become very popular among event participants. We love to connect large and small businesses for the common good and growth of one another”.